Binary Selves was a two-channel video installation created in a 6'x20' space (hallway type space, closed end, long rectangle). The walls had top to bottom alternating vertical lines (ranging from 3-36" in width) of mirror and black; the mirrors created an illusion of infinite space and reflection broken up by the staggered pattern of black. 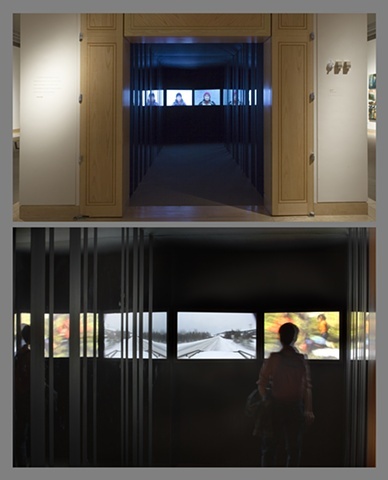 As the viewer walked down the length of the space, the mirror widths increased so that when you reached the far end of the space, the mirrors were at their widest and one's reflection was the most complete and therefore, multiplied infinitely which were next to the infinitely repeated images from the video screens. The video monitors were two 40" flat screen monitors, set at a wide angle (approximately 120 degrees), which created a triangle between the two screens and the viewer. I love how installation art allows the creation or opportunity in which the viewer can enter an alternate world in which they become a part of the work, engaging and experiencing an environment in an endless number of ways from multiple perspectives (instead of simply viewing it from a one-point perspective). It allows the possibility of entering another world, to stretch one's experience into the imagination of another.